Play, dig, plant, learn, create and explore Ramsey County’s best nature play area! Conveniently located in Tamarack Nature Center’s back yard, Discovery Hollow lets you run wild in nature! The Wood: Build a tree fort! The Overlook: Climb the cliffs. The Stream: Make a dam and learn how water flows. The Garden: Help grow plants, pull weeds and water. The Mud Table: Play in the mud! The Hobbit House: Crawl in and over the house like a hobbit! 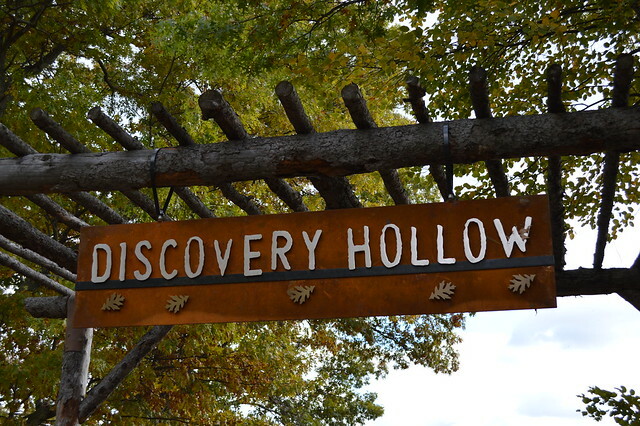 Discovery Hollow may be open on select evenings. Please call for more information. Organized groups not associated with a naturalist-led program or facility rental must pre-register for their time in Discovery Hollow. Groups with 13 or more kids will pay a special use permit fee based on group size. Please call 651-407-5350 for more information. Tamarack Nature Center also offers a variety of group programming options all year long.